Custom Jewelry Is The Key, Literally! 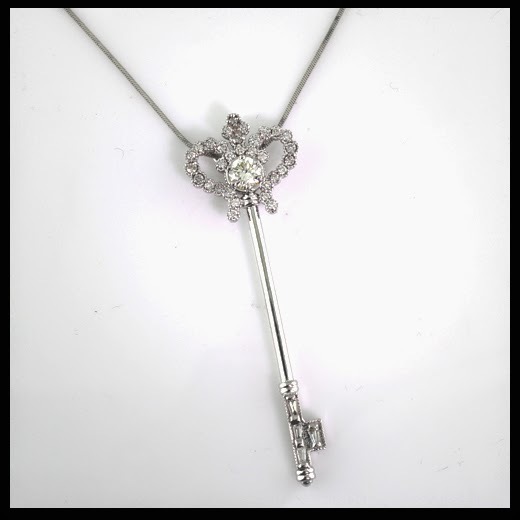 A custom diamond key pendant created at Scott’s Custom Jewelers. Back in the day, a woman’s diamond engagement ring usually started out on the small side. The eighties were known for simple diamond solitaire rings in yellow gold. A gold wedding band, with some small, channel set diamonds followed. Then maybe a diamond guard for a one year anniversary gift. Usually, around year 10 or 20, there was a complete diamond upgrade. New center stone (hopefully much bigger!) and even more diamond bling. Not everyone traded in their first diamond wedding set. It was generally pushed to the back of the jewelry box, with the mood rings and tangled herringbone chains. Sue had that jewelry box. Here’s the thing. We women are sentimental fools. We don’t throw anything away. Heck, I’ve got six kids worth of baby teeth in my jewelry box! (It’s pretty gruesome, actually – Law and Order would think I’m a perp!) And if there was a way to wear that first diamond again, why, of course we would. Sue saw what we did for others, and came to us with her project. She actually knew she wanted a custom key pendant created, but most people have no idea what they want when they walk into our jewelry stores – FYI: we just opened our Dublin, OH store this month! Stop by and say hi! We took apart the diamond rings and started laying them out. Scott was able to show Sue several custom jewelry designs before she landed on this particular style. The key pendant lets us use many shapes of diamonds in the piece. Did you notice the long baguette diamonds on the end? Pretty sweet. We printed out a polymer model of the key, painted it silver (for white gold) and placed the diamonds on it so she could see exactly what it would look like. She even tried it on! Then we casted it in white gold, set her diamonds and voila! A custom diamond key to her heart pendant! Nothing beats the thrill we get when our customers see their finished jewelry for the first time. It’s such a great feeling. We’ve chosen to specialize in one-of-a-kind, custom jewelry. That’s why custom is our middle name! Stop by and see for yourself.